It was around same period last year, when Infinix announced the Hot 4 and the Hot 4 lite. So it no surprise to us seeing that, despite the fact that Hot 4 is still trending, the company has updated the series with the Hot 5 series. Again, we see Infinix paying more attention to the low-end market, considering that both the Hot 5 and the Hot 5 lite, and both target at the midrange to low end smartphone users. However, those that means that the Infinix Hot 5 lack pro features all through? Certainly not! If nothing is captivating to us, the presence of a dual front-facing speakers, peaked with Dirac 3D Stereo system, and the large 4000 mAh battery should get any pro smartphone user wanting this device as a secondary backup. Below are other unique features and specifications of the Infinix Hot 5. If you want to see full details of the device, please click here for the full specs. 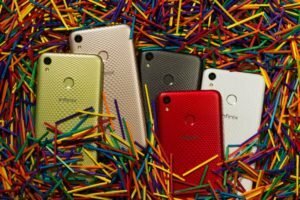 The Infinix Hot 5 will be able in multiple color options, ranging from Black, Red, and midnight blue. As for pricing, the smartphone should set you back between N35,000 to N40,000 Nigeria Naira. Hello please I need your help my infinix hot 5 fingerprints scanner is not working please help me out……..